IBM researchers demonstrated the potential of carbon nanotubes to become a successor to silicon for the production of compute chips. For the first time, researchers showed how to precisely place and test over ten thousand carbon nanotube devices in a single chip using mainstream manufacturing processes, illustrating how the technology could become a viable alternative to silicon in future computer chips. IBM (NYSE: IBM) scientists have demonstrated a new approach to carbon nanotechnology that opens up the path for commercial fabrication of dramatically smaller, faster and more powerful computer chips. For the first time, more than ten thousand working transistors made of nano-sized tubes of carbon have been precisely placed and tested in a single chip using standard semiconductor processes. These carbon devices are poised to replace and outperform silicon technology allowing further miniaturization of computing components and leading the way for future microelectronics. Aided by rapid innovation over four decades, silicon microprocessor technology has continually shrunk in size and improved in performance, thereby driving the information technology revolution. Silicon transistors, tiny switches that carry information on a chip, have been made smaller year after year, but they are approaching a point of physical limitation. Their increasingly small dimensions, now reaching the nanoscale, will prohibit any gains in performance due to the nature of silicon and the laws of physics. Within a few more generations, classical scaling and shrinkage will no longer yield the sizable benefits of lower power, lower cost and higher speed processors that the industry has become accustomed to. Carbon nanotubes represent a new class of semiconductor materials whose electrical properties are more attractive than silicon, particularly for building nanoscale transistor devices that are a few tens of atoms across. Electrons in carbon transistors can move easier than in silicon-based devices allowing for quicker transport of data. The nanotubes are also ideally shaped for transistors at the atomic scale, an advantage over silicon. These qualities are among the reasons to replace the traditional silicon transistor with carbon – and coupled with new chip design architectures – will allow computing innovation on a miniature scale for the future. 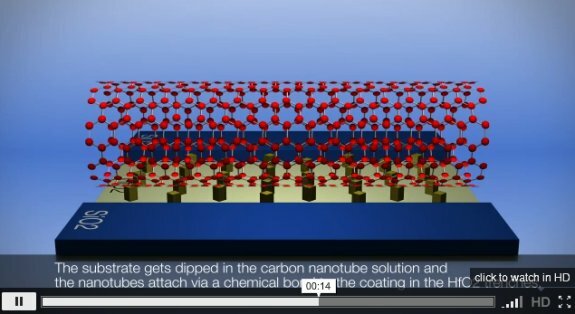 The approach developed at IBM labs paves the way for circuit fabrication with large numbers of carbon nanotube transistors at predetermined substrate positions. The ability to isolate semiconducting nanotubes and place a high density of carbon devices on a wafer is crucial to assess their suitability for a technology – eventually more than one billion transistors will be needed for future integration into commercial chips. Until now, scientists have been able to place at most a few hundred carbon nanotube devices at a time, not nearly enough to address key issues for commercial applications. There are practical challenges for carbon nanotubes to become a commercial technology notably, as mentioned earlier, due to the purity and placement of the devices. Carbon nanotubes naturally come as a mix of metallic and semiconducting species and need to be placed perfectly on the wafer surface to make electronic circuits. For device operation, only the semiconducting kind of tubes is useful which requires essentially complete removal of the metallic ones to prevent errors in circuits. Also, for large scale integration to happen, it is critical to be able to control the alignment and the location of carbon nanotube devices on a substrate. To overcome these barriers, IBM researchers developed a novel method based on ion-exchange chemistry that allows precise and controlled placement of aligned carbon nanotubes on a substrate at a high density – two orders of magnitude greater than previous experiments, enabling the controlled placement of individual nanotubes with a density of about a billion per square centimeter.